It all started with a tortilla. In 1963, San Diegan Roberto Robledo opened a tortilla factory in San Ysidro just to make ends meet. His sons filled the baskets on their bicycles full of tortillas and sold them door-to-door. With the success of the tortillas, came the creation of the Roberto's burrito. A carne asada burrito sold for 10 cents at Roberto's first restaurant, opened in 1964. Today, the Roberto's tradition carries on with several San Diego locations, including the beachgoer's paradise off Carmel Valley Road, owned by Roberto's son, Rolando, and his wife Cecilia. People start feasting on those filling breakfast burritos at 9 a.m. The restaurant stays jam-packed all day long with diners eating out on the porch and views of the beach in the near distance. Most everyone has sand still stuck between their toes. "You can't really beat the spot; it's just right off the beach," said Roberto's customer Jon Douglas of the Carmel Valley restaurant that has been a fixture there for 27 years. Roberto's now has other restaurants at Encinitas, Leucadia, Solana Beach and Mission Valley, which opened in late spring. Robledo died in 1999. His five sons own and operate the outlets. How busy is it? Attempting to pin down a time when the Mexican eatery is at its busiest, operations director Ray Gomez said lunchtime throughout the week gets pretty crowded. Then again, early evenings around 7:30 p.m. also draws a crowd. And then there's the Saturday and Sunday morning surfer rush when the streets are lined with surfboard toting cars. "And right after the horse races, we get slammed," Gomez added. Almost every item on the menu is under $5. 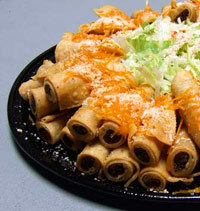 Only the combos are $6 to $7 for enchiladas, tacos or burritos with sides of Mexican rice, beans and chips. Breakfast burritos have eggs, salsa and cheese. Machaca - shredded beef - and chorizo - spicy beef sausage - burritos are served as well as hash brown burrito, stuffed with hash browns, eggs, cheese and bacon. Tacos and burritos come with carnitas, carne asada, beef, chicken or fish. Carne asada is the most popular burrito, and served with guacamole and salsa. A hefty California burrito comes with carne asada, potatoes, sour cream and cheese. "Everyone invents their own burritos too," Gomez said. Make it ‘wet' It's common to hear someone ask for potatoes, extra lettuce, sour cream or guacamole on their burrito to specialize it and make it their own. Gomez said he now orders his carne asada burrito "wet" after hearing a customer asked for it that way. Wet, he said, means the burrito arrives on a plate drenched with white enchilada sauce, a little cheese and lettuce sprinkled on top. "You feel you're going to get a home cooked meal," Gomez said. "It's like ma and pop are in the back smashing beans, and somebody's rolling tortillas." For dessert, 99 cents will buy cinnamon chips that come with maple syrup for dunking. BEST MEXICAN FAST FOOD IN SAN DIEGO! "Fresh, authentic, quality ingredients, simple food at modest prices and satisfying portions" was Roberto and Dolores Robledo dream when they founded Roberto's Mexican Food in San Diego. Roberto's Taco Shop and Mexican Food in San Diego soon grew to become a family run "Fast-Food Institution" and has spun off numerous imitators. There are several taco shops in San Diego whose resident's have made it one of their favorite cuisines. Roberto's Very Mexican Food has become a strong community icon in the north coastal area of San Diego. The stores were established throughout the 1980's and 1990's. They have a well-known reputation and a good number of loyal customers that, in spite of all the new competition, still choose Roberto's as their "favorite taco shop in San Diego". Today Roberto's menu, contains a wide range of meals suited for different needs and tastes. We offer a sit down or phone-fax-order service. We listen to our customers and always make improvements to our menu. What never changes is the quality with which we make our meals.